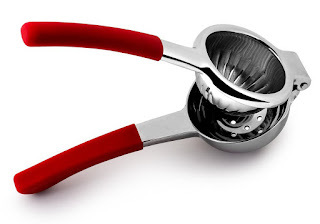 Stainless Steel Citrus Fruit Squeezer - This will last. We've broken 2 other brands prior to this, and wanted real quality that will last. Exceeded our expectations! Vinomaster Red Wine Aerating Pourer - YES! Digital Cooking Thermometer - This is the BEST thermometer out there. Exact! Metallic Wine Glass Pens - Great for wine glasses, casserole dishes, and more.